The word "politics" probably conjures up an image of Theresa May facing Jeremy Corbyn over the despatch box - and despite the hooting from the backbenches we might not think that this has much to do with chimpanzees. Yet many of our fellow primates are our equal in their desire for power and ability to manoeuvre others to get hold of that power. Chimpanzees are intensely political animals. They live in social groups of about 50 with male leaders who have to engage in a variety of political manoeuvres to get to the top. Professor Frans de Waal's book Chimpanzee Politics details the shifting coalitions created among chimpanzees to take power at Arnhem Zoo in the Netherlands. He argues that it is not enough to simply be the strongest. "The best alpha males in chimpanzee communities are not necessarily the biggest and strongest males," he says. "You have to have supporters which means you have to keep these supporters happy. You have to be diplomatic." Part of this diplomacy involves forming coalitions with other males. This can be very strategic and mirrors what we see politicians within parties doing all the time. "If you have three males and one of them is overwhelmingly strong then there's a tendency for the other two to gang up together against that male," says Prof de Waal. "Because if they attach their political weight to the top male who is that strong male they're just an accessory to his power." "The Japanese scientist Toshisada Nishida studied one chimpanzee who ruled for 12 years," says Mr de Waal. "He would appropriate the meat of other males and then selectively share with his supporters and selectively not share with his rivals. He had a whole bribery system that worked very much to his advantage." In effect, that chimpanzee leader was taxing the group and then returning those resources to selected supporters. Clearly bribing voters with their own money is not unique to human politicians. Another similarity involves conflict between groups. Chimpanzees often raid and ambush other troops, brutally killing rival group members. They also face danger from other animals such as snakes. And just as in human politics, these external threats can silence internal dissent and shore up support for leaders. Marc Hetherington, a professor of political science at Vanderbilt University in Tennessee, studies how voters sometimes "rally around the flag". "George W Bush in the early 2000s went from not being a particularly popular president, especially at the beginning of his term, to having 90% approval after the September 11 2001 terrorist attacks. "This is one of the textbook examples of rallying round the flag." Other primates show the same tendencies. Dr Alison Cronin is a primatologist, and director of Monkey World in Dorset. "If you have an external threat that's a danger effectively to everybody, it brings the group together, you rally together," she says. "And people who you might not even like on a day-to-day basis, if you're going to join up as a band of brothers to defend the realm, then all for one and one for all." These parallels shouldn't be too surprising. Human are primates. And for most of human evolutionary history we lived in small tight-knit groups of hunters and foragers in which coalitions of individuals vied for leadership. That history can mean that we are potentially making political decisions in a way that is often poorly suited to the modern world. Professor Michael Bang Petersen is an expert in evolutionary political psychology at Aarhus University in Denmark. "We act as if we still live in a small-scale society," he says. "Our brain is built to assume a small-scale environment and the solutions that we think are intuitively right are the solutions that work well in a small-scale society." This can make it difficult for people to hold principled political attitudes as we naturally prefer to think about things on a case-by-case basis as we did in small groups. For example, Prof Bang Petersen says, rather than considering which punishments fit which crime, we prefer to think about which punishments fit which criminal. Remarkably, these hangovers from our past even extend to basic questions about income inequality. Prof Bang Petersen argues that, on average, physically strong people prefer less income redistribution because they forget that redistribution policies are determined by factions in Parliament not whether they can enforce them physically. At the same time, our willingness to cooperate is a crucial part of why democracy works and this too can be traced back to when we lived in small groups. Think about voting. 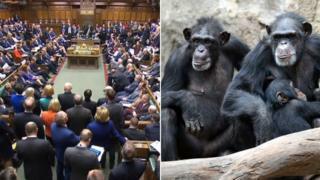 Image caption Does our evolutionary history explain why so many of us turn out to vote? No individual vote will make any difference to the result, so why do so many people vote? Prof Bang Petersen argues that this too is part of evolutionary heritage. "People feel that voting is important and that makes intuitive sense for our mind that is designed to navigate small-scale politics where each individual could indeed be decisive. "That stems from high levels of cooperativeness." Of course, we should be a bit cautious about saying that we are simply products of our evolutionary history and that other primate behaviour is just a mirror of our own. There's an obvious difference between humans and other primates: language. Language, alongside greater cognitive capacity, allows us to make laws and plan ahead. Language allows us to create groups that are national, not just local, and include people we will never meet. But that can still mean that we sometimes behave as if those groups consist of 50 people on the savannah scratching a living from hunting and foraging. And next time you are watching PMQs, it is worth remembering that we are, in the end, just one political primate among many.